The high debt levels have not only bought firms under severe stress, it has also bought to the fore concerns of economic stability and the growth trajectory of country. The Indian economy's powerful performance in the years prior to 2012/13 prompted companies to take on debt to finance expansion plans. However, with economic conditions not having panned out as hoped, companies got saddled with high levels of growth-inhibiting debt. This requires them to find ways to repay their debt. The level of corporate leverage for India is among the highest among emerging economies as shown by IMF studies. The high debt levels have not only bought companies under severe stress, it has also bought to the fore concerns of economic stability and the growth trajectory of the country, given that Indian banks have been bearing the brunt of the stressed corporate debt. Growth in debt issuances has slowed down as has bank credit due to a combination of slow economic growth as well as caution exercised by companies in borrowing funds. Weighed down by high levels of non-performing corporate debt, banks have been less willing to lend, as evidenced by the low growth in bank credit. This, in turn, has a bearing on fresh investments and on India's economic prospects. An analysis of 1,812 non-financial companies showed that aggregate debt had been growing 13 per cent annually between 2010/11 and 2013/14, barring 2011/12 when it rose 18 per cent. Cumulatively, the debt of these companies increased 51 per cent during the four-year period. The growth in aggregate net worth (equity + reserves) of these companies fell from 16.3 per cent in 2010/11 to 8.6 per cent in 2012/13. The debt-to-equity ratio has increased from 0.58 in 2010/11 to 0.67 in 2013/14. 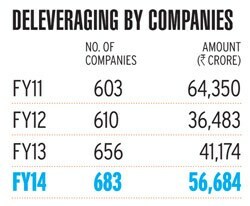 The number of companies that have been deleveraging has been rising in the last four years, from 33 per cent of the companies in 2010/11 (of the sample of 1,812 non-financial companies) to 38 per cent in 2013/14. In volume terms, companies have reduced their debts by 43 per cent, 13 per cent and 38 per cent in 2011/12, 2012/13 and 2013/14. Indian companies have been reducing their debt levels in an attempt to improve their business performance and credit profile. They are taking a number of steps to achieve this. For instance, companies have been restructuring business operations to maximise revenue and profitability. This has been directed to ultimately lowering the debt component. They have also been using cash balances and selling off their assets (usually non-core) to lower their debt. Companies are also raising funds by way of stake sales and issue of shares and other financial instruments such as global depository receipts. Replacing such debt has had a positive impact on the balance sheets. Companies are also seen opting for debt restructuring and takeout financing by replacing costly debt with low-cost funds from global markets. The measures have been bearing fruit as the credit quality of companies has seen a noticeable improvement in recent times (since the fourth quarter of 2013/14 and particularly in the second quarter of 2014/15). The credit ratings (upgrades, downgrades and reaffirmations) assigned by ratings agencies to companies provide evidence of this improvement. CARE Ratings' modified credit ratio (MCR), which helps measure mobility in ratings (an increase in the MCR implies stable and improving credit quality of the rated entities), has risen to a three-year high in the second quarter of 2014/15. This ratio was below 1 (indicating more downgrades as compared to upgrades) from the fourth quarter of 2011/12 to the first quarter of 2013/14, reflecting the deterioration in credit quality of companies. Given that CARE rates a large and diverse set of entities, the movement of MCR can be regarded as being indicative of the general business and economic environment of the country. However, challenges remain as using the asset sale route to deleveraging tends to be time consuming and liquidity concerns have to be addressed in the interim period. The recent spurt in the stock markets has opened an additional window for promoters willing to dilute equity through a preferential issue of shares at a premium. Rajesh Mokashi is the deputy managing director at CARE Ratings.